The Chinese Spring Festival in 2018 came late. February 15 was the anniversary of Mr. Edgar Snow's death, also Lunar New Year’s Eve. This happened to be a time of long holidays, when people were either busy preparing meals for family reunions at home or out traveling. And so Beijing was not as bustling as usual, with very few people and cars on the road. On this morning, I was accompanied by fellow family members of June Fourth victims, Yin and You, who were suffering from illnesses. 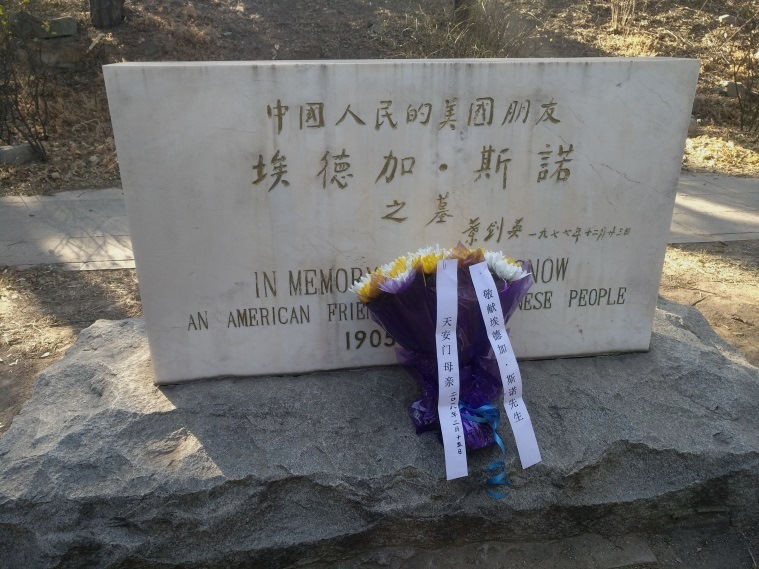 As in previous years, on the anniversary of Mr. Snow’s death, I went to visit his grave at Weiming Lake in Peking University. Perhaps due to the strict security, on campus it was quiet everywhere, with hardly any people in sight. And it was even so on the hillside and at Weiming Lake. In the past few days, the temperature had risen and Weiming Lake had begun thawing. Although the lakeside was covered with ice, the center of the lake was completely melted. Several ducks played in the water and swam back and forth freely. They were so lovely and added a bit of freshness and vitality to Peking University. Walking toward Mr. Snow’s grave at the lake, looking at it from a distance, I saw someone leaning over and sweeping the ground. When we approached, I found it was Xiao Huang, a fellow family member of June Fourth victims who lives near Peking University. Every year she came here earlier than we did. As we walked up the steps to the Mr. Snow’s tombstone, we found the entire grave had been swept clean by Xiao Huang, who still had the broomstick in her hands. We asked: "Where did you find the broom?" She replied: "This broom was just under the tree nearby." I said quietly, "This was really a heavenly arrangement!" Xiao Huang also told us: When she came, she found four withered red roses in front of Mr. Snow’s tombstone. We guessed that there were some thoughtful people who came to visit the grave before the New Year. Clearly, our grave-sweeping efforts were not alone. There is no lack of affectionate and righteous people in China. We then felt comforted on behalf of Mrs. Snow and her family. The unpleasantness of being blocked at the school gate was also swept away. After all, this day was already the end of year. We were unable to stay a bit longer at the lake and grave site after our visit, as in previous years. After laying the flowers, paying our respects, and taking pictures, we left the cemetery. Although I live alone and have a lot of time, my friends both had family members, young and old, waiting for their return home to celebrate the New Year. In the few days after I came home, I have been struggling to reflect on this question: Was the suggestion that I gave to Mrs. Snow eighteen years ago wrong? In the spring 2000, accompanied by her son Christopher, the already 79-year-old Mrs. Snow traveled across the ocean to China to visit her husband’s grave. After leaving Peking University, she came to Renmin University to visit me. What we didn’t anticipate was that at the entrance to Renmin University, not only was she and her son arbitrarily prevented from entering to meet with me, this also led to the arrest of Sun Bingxian—a fellow family member of June Forth victims (now deceased) who had met with Mrs. Snow on my behalf—by the national security forces. In order to rescue Su Bingxian, in desperation, Mrs. Snow sent a letter of protest to Zhu Rongji, then Premier of the State Council, demanding the immediate release of Su, and stating that she would not come to China in the future and would consider moving Mr. Snow’s grave out of China. What were they afraid of? Why did they try so hard to prevent a mother and her son from expressing their sympathies and consolations to another mother who had lost her son?—when I learned that Mrs. Snow wanted to move Mr. Snow’s grave out of China, I was really shocked and instinctively urged her to give up the idea of moving the grave. In order to relieve her, I solemnly promised: As long as I’m alive, I will go to Peking University every year to visit Mr. Snow’s grave, for her and her family, and will not let him be lonely! A promise kept. It's been over 18 years! 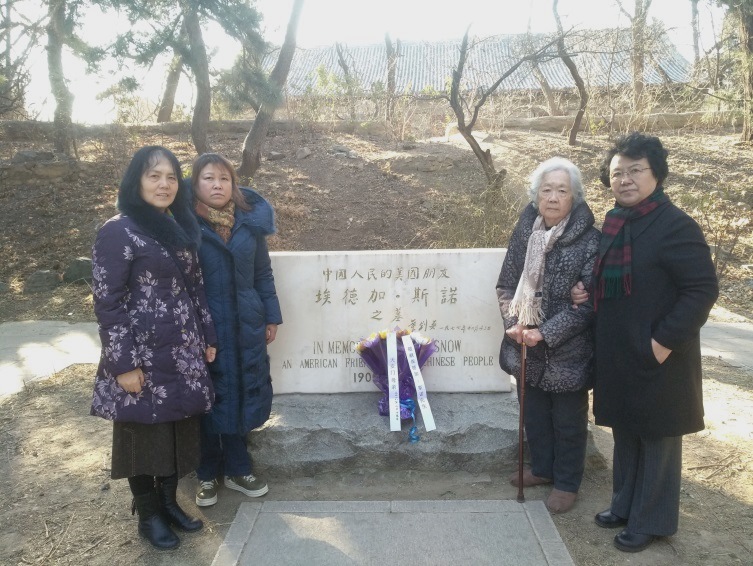 In the company of my husband (who died of illness in September 2015) and fellow family members of June Forth victims, I’ve gone to Weiming Lake at Peking University in the morning of February 15 every year to visit Mr. Snow’s grave. In the first few years, not only was the grave deserted and unclean, but also the vicinity of the tombstone and the lakeside were under the surveillance of individuals in plain clothes. However, they had never stopped us. Later, I can't remember starting in which year, no one “escorted” us anymore, and the grave was cleaner than before. More surprisingly, on February 15, 2012, when we went to the grave on the morning of the 40th anniversary of Mr. Snow’s death, we found that there were four wreaths placed in front of the tombstone, each signed by a different institution. What a display! Not far away, there were many different kinds of cars parked behind the small auditorium of Peking University. I guessed that in the small auditorium, there might have been some powerful people who were holding a “grand” event to commemorate Mr. Snow. I did not think deeper on it at that time and was even a little relieved, believing maybe the authorities had become "enlightened" or had "progressed" a little, and finally remembered this "old friend of the Chinese people!" Another several years passed. One day in 2017, I suddenly saw on a TV program listing that there was a program called "Snow in China." I didn’t watch it, so I didn’t know which official unit had made it. But the thought made my heart pound excitedly. It is true that Red Star Over China, written by Snow, influenced several generations in China and even in the world. For this reason, Snow himself and his whole family paid a heavy price. They were persecuted during the McCarthy era in the fifties in the United States and the whole family was forced to leave their homeland and relocate to Switzerland. He had lived there until he died. In my family, Red Star Over China was read by all, young and old, and the book became worn. At some point my husband recreated the book cover and wrote the title on the front in his own hand. 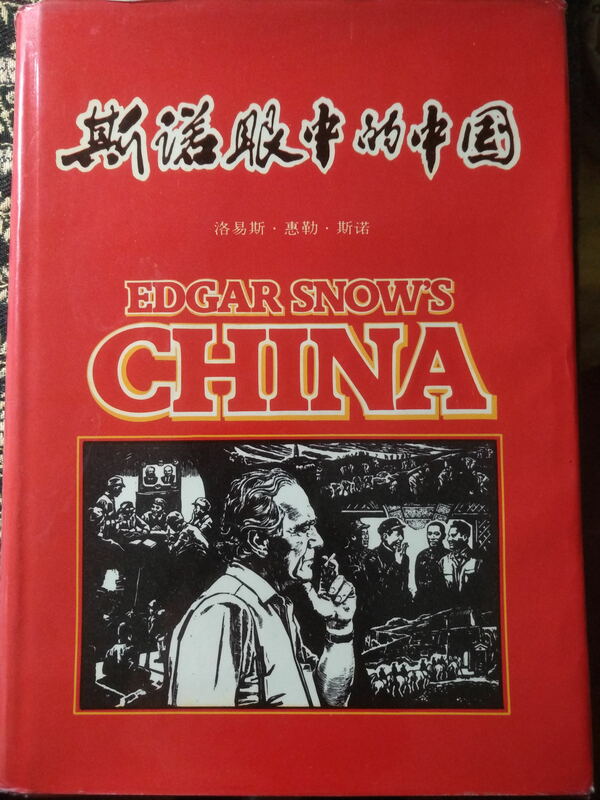 In my family we also have the book Edgar Snow’s China, which Mrs. Snow entrusted Su Bingxian to give to me when she came to China in 2000. (This hardcover collection, edited personally by Lois Wheeler Snow, was translated and published by China Academic Press in 1982. At that time, the national security department probably mistakenly believed she had given me some important confidential documents.) I have kept these treasured books in my cabinet. Now I have re-read these two books, in order to remember the deceased, but also to find the answer to my previous question. No one can deny that, ideologically, young Snow and old Snow were distinctly different. But the thoughts of each of us can change over time, and our understanding of people and things in the world can also go through a development process, so why can't Mr. Snow also have been this way? Mr. Snow was human, not God. His contributions and errors in the course of his life will be assessed by history. But there are two points that are consistent and constant in him: that is the spirit of seeking truth and the capacity for great love for humanity. I admire Mr. Snow’s spirit of seeking truth as a journalist. That year, it was the power of this spirit that supported him when he went into the loess caves at the western border of China and approached the Communist Party of China and its leaders. Decades later, it was also the power of this spirit that supported him when he visited China again—in his later years, ill, and accompanied by his wife—to walk up to the top of Tiananmen Gate, and approach Mao Zedong. He had witnessed the absurdities, ruthlessness, and madness of personal worship during the “Cultural Revolution.” Acting as an old friend, he directly disclosed his bewilderment to the supreme leader of Communist China, and, in the end, left China with disquiet, doubt, and regret that his questions could not be answered by the other side. However, even so, his original intentions never changed, and with his great love for the Chinese people, he worked tirelessly to build diplomatic bridges and communications between the United States and China, striving towards this until he passed away. What’s even more moving, he left his last wishes in the note to his wife that she could only read after his death: "I love China, and I'd like to leave part of my ashes there after I die. . . ."
Even more, I admire Mr. Snow’s courage to face reality, face history, and refute himself. It was this fearless "denial" that gave Mr. Snow's life a perfect ending. And who can deny that Mr. Snow’s wife and children, Christopher and Sian, are the ones who could most vividly feel the evolution of his thoughts and the painful struggle in his mind! I believe that eighteen years ago, Mrs. Snow and her son traveled thousands of miles to visit us, the forlorn family members of “June Forth” victims, precisely because they had inherited Mr. Snow's spirit of great love for humanity. If Mr. Snow’s “old friends”—the generation after generation of Chinese leaders during his lifetime—have any respect for the dead buried at Weiming Lake, they must face up to the evolution of his thoughts from his younger to older years. They shouldn’t just pick out his praises of and propaganda for the Communist Party of China of his youth and use it today, or ignore his reflection and self-denial of his later years. No one has the right to separate the young Snow from the old Snow, and then unreasonably impose this kind of “rejection of denial” on the deceased. What's more, since the authorities turned against Mrs. Snow in 2000, Mr. Snow and Mrs. Snow were treated differently. When the media republished the images of Mr. and Mrs. Snow with Mao Zedong at the Tiananmen Gate in the 1970s, the image of Mrs. Snow standing on the left side of Mao had been cut off. Does this kind of narrow-minded action befit a "great nation"? Is treating an “old friend” in this way consistent with the traditional Chinese morality currently advocated for by the country?! Thinking of this, I feel there’s nothing more I can say. As a Chinese, I feel deeply ashamed. All I can do is try my best in my life, and persist in going to visit Mr. Snow’s grave every year to make up for my country’s embarrassment to its “old friend” and his family members, and so as to provide some comfort and relief to Mrs. Snow and her family, thousands of miles away. Actually, it is still not too late to make amends. In my opinion, what the authorities most urgently need to do now is apologize to Mrs. Snow and her daughter Sian (her son Christopher died a few years ago), and invite her family members to visit Mr. Snow’s grave and participate in commemorative activities, nothing more. Although Mrs. Snow is elderly and unable to travel far, she has family members who can! May God bless honest people! Beijing—I have come to China, accompanied by my son, to visit my husband's grave at Beijing University. While in Beijing I want very much to call on Professor Ding Zilin. I understand that she is under surveillance but I trust this will not prevent my visit to her. It is a visit from a mother with her son to extend sympathy to a mother who has lost her son, and to bring her whatever solace we can. It is also a gesture of solidarity with the other mothers and families who, more than ten years ago now, had their loved ones taken from them in the violence of Tiananmen and who, as a result, have been deprived of normal lives and liberties. 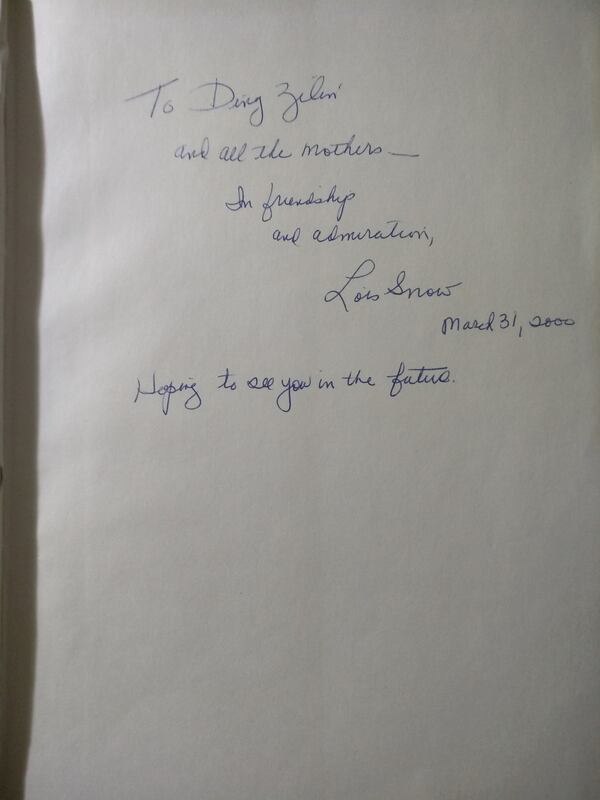 My visit is undertaken in a spirit of friendship, the friendship my husband and I have always had for China and the valiant Chinese people, a friendship which began with Edgar Snow in the early years of China's struggle to create a better society and which I have steadily maintained since his death. I come to Beijing with an earnest public appeal to the Chinese authorities to permit Ding Zilin to receive and distribute the funds that have been donated to her as humanitarian assistance for the bereaved families, some of whom cannot even afford to pay their children's school fees. I have brought with me a modest contribution to this end from my own family and friends. In making this money available, we join others who reach out to a remarkable woman and to those who support and are supported by her courageous efforts to ease their plight. Ding Zilin has written: "I cannot turn a blind eye to the pain of those who suffer my fate. In this cold and uncaring world, they have lost their loved ones and have nowhere to turn for consolation. As a group, they have been forgotten or forsaken by society. Under these circumstances, others may be able to close their eyes, but I cannot." Neither, I would like her to know, can I. Having recently been in contact with Ding Zilin, we know that she is at her residence at People's University and that she is expecting our visit. We are planning to see her tomorrow, Saturday at 11:00 am. We look forward to meeting her.